The Kidde Combination Carbon Monoxide & Smoke Alarm provides two important safety devices in a single unit. 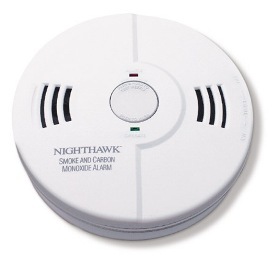 The 900-0102 combination alarm includes a voice warning system that announces "Fire, Carbon Monoxide or Low Battery". The voice alarm eliminates any confusion and clearly warns you and your family of a smoke or carbon monoxide danger. This battery operated technically advanced combination alarm provides protection even during a power outage when most incidences occur.